WSA Koblenz (WasserSchiffahrtsAmbt) has awarded Damen Shipyards Group a contract to build a new diving bell ship. 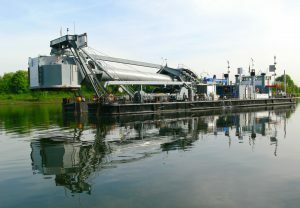 The ship will succeed an existing vessel – Carl Straat, which has been in operation since 1963. The new vessel, like her predecessor, will operate in the River Rhine and its tributaries. The vessel can also be used to produce barrel anchors in the gravel or rocky area and to carry out sampling by drilling with nitrogen icing. The modern diving bell system including the lifting device makes it possible for the vessel to be able to travel on the Rhine and its tributaries and to operate without lowering the water level. Do to the proven suitability of Carl Straat the new vessel will draw heavily on its predecessor. Damen will, however, apply the latest technology to the new vessel to ensure its suitability for the years to come. The newbuild will be equipped with high-performance diesel-electric propulsion compliant with EU stage V standards and guaranteeing a constant cruising speed of 13 km/h. With a total length of 69m, the vessel will be 17m longer than the Carl Straat.